Rubber meets the road at the 35th Annual Metro Bus Roadeo held Sept. 25 in the parking lot of the Santa Anita Racetrack in Arcadia. In the harder than it looks department, Metro’s top bus operators and mechanics squared off in 100+ degrees heat in the giant parking lot of the Santa Anita Racetrack on Saturday. Top Ops: Operators Juan Navarro and Joe Acosta. Returning champion Navarro wore the crown in 2008. Runner-up Acosta was the top contender in 2009. Maybe you’ve never even considered what it takes to operate a bus, or, fix a bus, or, get crazy, park a bus, but the competitors burning up the asphalt in Arcadia weren’t counting on luck to rack up performance points. This stuff takes skill. 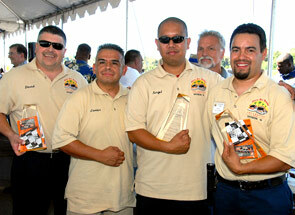 Thirty-five operators and 12 maintenance teams competed in 35th Metro Bus Roadeo. The winners will represent Metro at the annual international competition sponsored by the American Public Transportation Assn. 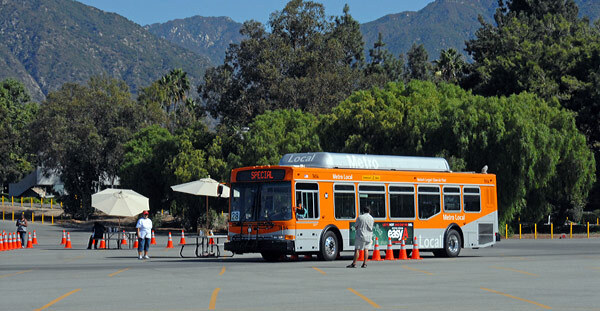 The competition consists of an obstacle course, in which operators maneuver 45-foot Metro buses through cones and barrels, and a mechanic’s competition in which teams of three race against the clock to diagnose and repair performance-related bus problems. The mechanics trophy went to the top-scoring team from Division 10 in downtown Los Angeles: David Klinkenborg, Javier Sora (coach), Angel Feria, and Jose Maya. In Saturday’s competition, bus operator Juan Navarro won with a score of 643 points out of a possible 700. The returning champion, who wore the 2008 crown, edged out operator Joe Acosta, who won in 2009. The victors will carry Metro’s flag at the internationals next May in Memphis. While I’m sure that this is fun for employees, I’ve got to ask who is paying for this. I sure hope it’s not Metro. It seems in poor taste given the recent fare increases and service cuts. Even if the amount of money is “small”, I’d say now is a time to stand in solidarity with your battered straphangers.